As of last Friday, Sept. 30, students taking SafeRide after 10 p.m. will need to bring their MIT IDs. Additionally, the Boston East and West routes now stop near further north on Massachusetts Avenue than previously. The change to require IDs follows frequent incidents of vomiting and disturbances caused by non-MIT students in the past year in the SafeRide shuttles. People accompanying MIT students or affiliates are able to use SafeRide, said Ellen E. Sojka, co-chair of the student-organized SafeRide Committee, and cross-registered students from Wellesley also have access to SafeRide with their IDs. The Prudential Building stop added last semester was a major source of non-MIT riders, leading to the new requirement, Sojka said. Besides the disturbances reported, non-MIT riders also use seats on the limited-capacity vans. The new policy has met mixed reviews. “MIT has the right to do it,” but the changes will inconvenience many alumni who will now have to carry their IDs with them, said Charles F. Dominguez ’05. The policy does present a problem in the worst-case scenario of a drunk MIT student who has forgotten his or her ID and must walk home instead. 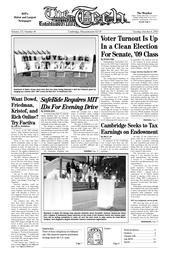 “In this case then, MIT Medical should be contacted,” Sojka said. The SafeRide routes going south into Boston that formerly stopped next to the 77 Mass. Ave. crosswalk now pick up riders near the turnaround at the back of the Student Center along Mass. Ave.
Sojka said that it may be possible to build a bus shelter at the new stop, now that the No. 1 bus shelter is too distant. Nothing has yet been decided, she said.